I was asked by one of the members of the Hutto city council to take some photos of a special event last Friday night. 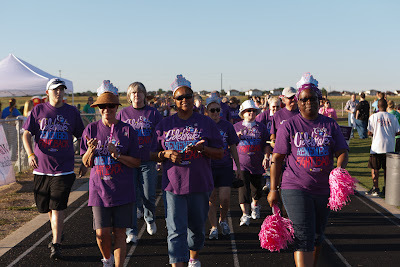 It was called the Hutto Relay for Life and it was a fundraiser for the American Cancer Society. The idea was to collect pledges of support and then spend the night on the track of a local school. 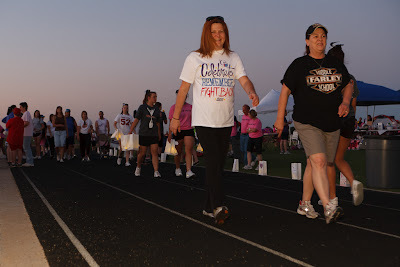 Cancer doesn't sleep and neither would a whole bunch of people who committed to walking the track all that night. It is a worthy cause and I agreed to stop by for a few hours and get some shots. There were some powerful moments at this event. Many cancer survivors were there, along with their families and support networks. The courage and fight in these people was evident, as was the joy and love of life as seen in their eyes. This shot was taken at the start of the survivors' lap around the track. The most emotional time to me was the placing of hundreds of luminaries along the track. Each one represented someone lost to cancer or currently battling the disease. I placed a couple myself - one in memory of my grandmother and the other for a friend of my family who passed last year. Walkers would circle the luminaries throughout the night. At one point, I was setting up some long exposure shots to capture the luminary lights in the darkness. A girl's voice called out behind me, asking if I would take a picture. I turned around and saw the following scene. "Wow" was all I could think. I had nothing to do with setting up this shot. It came from their hearts. 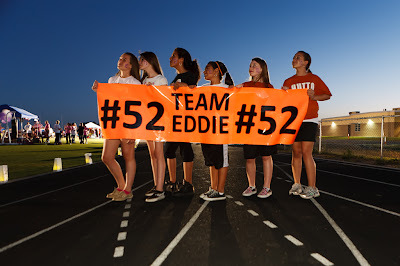 Eddie is a friend from school, an athlete who was diagnosed with cancer. They were there to raise money in hopes it might help him in his battle. I fumbled to change my camera settings while they waited. I was truly taken back. The sun was gone from the sky when I returned to take some long exposures of the luminary lights. I snapped a few off and checked my results. Another "wow" moment hit when I saw this image on my LCD screen. Now, it wasn't image itself that made it a "wow" moment. It was what I realized it represented. 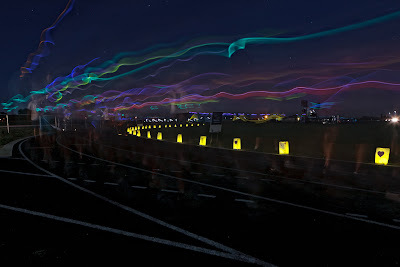 The blurry mixture of a crowd of people walking by, some with glow sticks or small flashlights, moving along a line of softly glowing luminaries, became a strong visual representation of what was going on. People moved together with one purpose and the lights represent the lives of those who struggle with cancer or have passed away because of it. People that we love leave something of themselves within us. Even if they pass on, that "something" never goes away. It travels with us, much like the wispy trails of light that flowed along the track amongst the crowd. I'm glad to donate some time and images to charities when I can. It's tough work covering an event. But, who knows? You may come away with an enriching experience, helping others in the process.